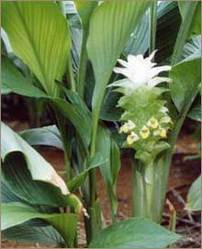 Common Name : Curcuma, Curcumae Domestica, Curcumin 95%, Terre-mérite, Terra Merita, Turmeric, Curcuma, Safran Boubou, Safran De Malabar, Safran Des Indes. Habitat : Cultivated extensively in india with in tropical climate. Uses : Turmeric is used extensively in foods for both its flavor and color. Turmeric has a long tradition of use in the chinese and ayurvedic systems of medicine. the rhizome (root) of turmeric has long been used in traditional asian medicine to treat gastrointestinal upset, arthritic pain. Turmeric has long been used as an anti-inflammatory, to treat digestive disorders, osteoarthritis, atherosclerosis, cancer and liver problems and for the treatment of skin diseases and wound healing. It is believed to strengthen the overall energy of the body, relieve gas, dispel worms, regulate menstruation, dissolve gallstones, and relieve arthritis. The active components of turmeric reduce the destructive activity of parasites or roundworms. It has also demonstrated in animals a protective effect on the liver, anti-tumor action and ability to reduce inflammation and fight certain infections. curcumin 95%, a potent antioxidant is believed to be the most bioactive and soothing portion of the herb turmeric. Curcumin 95% posses the properties like antioxidant, anti-inflammatory, anti-platelet, cholesterol-lowering antibacterial and anti-fungal effects. It contains a mixture of powerful antioxidant phytonutrients known as curcuminoids. Curcumin 95% inhibits cancer at initiation, promotion and progression stages of tumor development. It is a strong anti-oxidant, which supports colon health, exerts neuroprotective activity and helps maintain a healthy cardiovascular system.